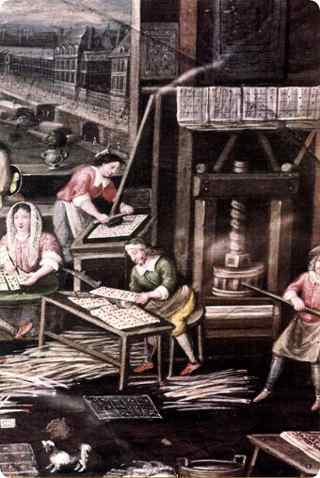 Above: The art of printing gave a great boost to the paper making industries and brought about a scarcity of old rags, until the technology for making wood pulp was improved. In the image above, we can see playing cards being pressed, polished and cut. Various utensils are lying on the floor, including a stencil, a pan and the trimmings from the edges of the cards. How much did playing cards transfer culture? Was the transference mostly national or international? Card games are a reflection of society. Just as cards games from, say, the Victorian era or the 1930s nostalgically evoke a tangible sense of those bygone times, cards from even earlier times, which were more varied in form and content, inspired commentaries, fables, romances, satires or burlesque scenes from daily life. 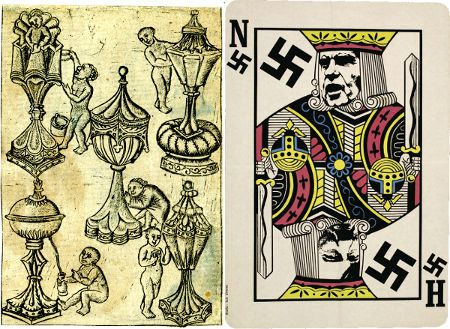 In a humble way, playing cards can be seen as conduits of popular culture and taste. The Gothic age, from the 13th - 15th centuries, saw fundamental economic and religious changes. Across the map of medieval Europe lay a tight web of trade routes, the arteries of commerce and exchange. The centre of gravity shifted from the land to the towns. 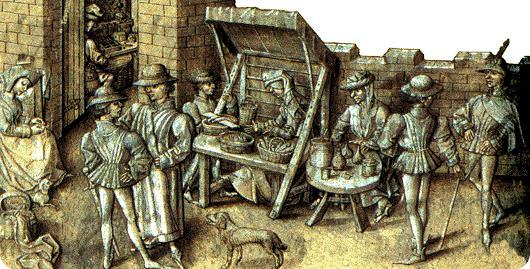 A new form of economy evolved, based on production for sale and exchange, in which merchants and craftsmen played increasingly important roles. With the advance in civilisation, arts and sciences, exchange of goods and merchandise, a new breed of men had arisen who pursued money-making as an end in itself. Successful merchants displayed their wealth with extravagance and grandeur... luxury playing cards were produced for the wealthiest clients. all favouring quicker and more affordable production. The invention of woodcuts towards the end of the 14th century, and Gutenberg's invention of movable type around 1440, made possible editions of multiple copies. it also gave a boost to the paper making industries. 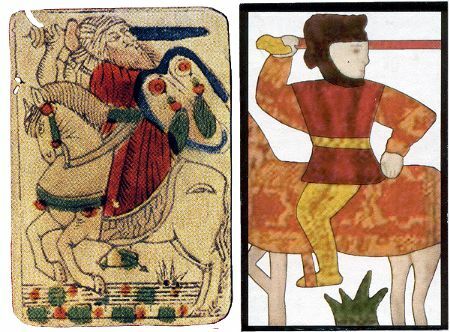 Above: two versions of the Cavalier of Swords, a) French/Spanish, mid-16th century, an Arab horseman with Saracenic motifs on the shield probably alluding to Arabic presence in the Iberian peninsula, b) Japanese imitation of early Spanish/Portuguese cards carried east by Portuguese mariners. 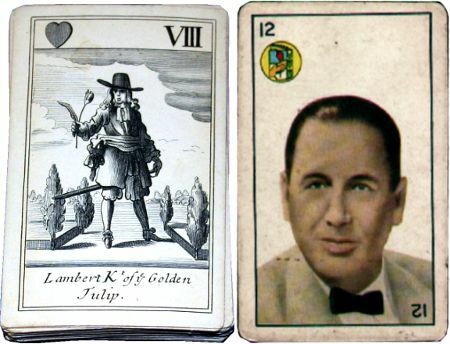 Above: two playing cards with political motivation, a) English, 'The Knavery of the Rump', 1679, b) Argentinian, 20th century, showing Juan Domingo Perón as the King of Coins in a bid to win popular support. 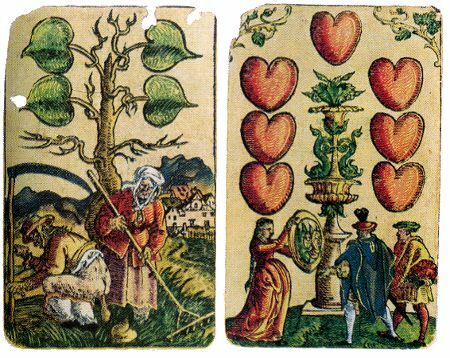 Above: two playing cards by Peter Flöttner with vulgar everyday activities of common folk satirizing bourgeois pretentiousness, Nuremberg, c.1535-1540. Above: a) engraved card by the Master of the Banderoles, Lower Rhine c.1470, showing ciboria (cups for holding hosts from the Christian Eucharist) adorned with naked children. Is this irreverence or playfulness, entertainingly merging spiritual and secular themes? b) political card with ideological message, 20th century. In this way Playing cards and card playing invaded daily life, influenced society and became a part of European popular culture (or sub-culture) - even reaching as far as Japan, Latin America and North Africa. Playing cards and card players first make their appearance in chronicles and records where we learn that as soon as they arrived in Europe they were disapproved or banned by religious and secular authorities. In 1423 St Bernadin of Siena preached against games and playing cards in particular, urging sinners to repent and burn such vain things. Gradually society became more open and less bound by strict rules. 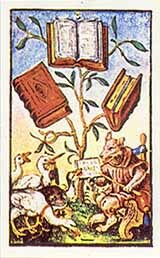 By the sixteenth century a colourful lexicon of descriptive expressions and popular sayings had entered into everyday language, as well as literature, poetry and popular ballads relating to card playing, including metaphors based on cards and card games (devil's picture book), the moral character of gamblers (cheats, swindlers, card-sharps) and the divinatory, amorous, social, religious or political meaning of cards. At the same time they were a bond which united people together. See also: Master of the Banderoles • Master PW Circular Playing Cards • Playing Cards & Religion • Design of Playing Cards • Manufacture of Cardboard • Rotxotxo Workshop, Barcelona • The Art of Stencilling.